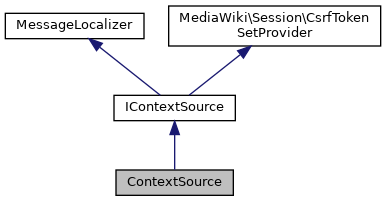 The simplest way of implementing IContextSource is to hold a RequestContext as a member variable and provide accessors to it. Definition at line 29 of file ContextSource.php. Definition at line 91 of file ContextSource.php. Referenced by SkinTemplate\buildContentNavigationUrls(), and OutputPage\getJSVars(). Definition at line 181 of file ContextSource.php. Referenced by ApiUpload\getChunkResult(), and ApiUpload\performUpload(). Definition at line 63 of file ContextSource.php. Referenced by ApiQueryQueryPage\__construct(), ActiveUsersPager\__construct(), ImageListPager\__construct(), ApiQuery\__construct(), ImageGalleryBase\__construct(), ApiMain\__construct(), HTMLForm\__construct(), OutputPage\adaptCdnTTL(), OutputPage\addParserOutputMetadata(), ApiMain\addRequestedFields(), Skin\addToSidebarPlain(), UploadForm\addUploadJS(), ApiQuerySiteinfo\appendDbReplLagInfo(), ApiQuerySiteinfo\appendExtensions(), ApiQuerySiteinfo\appendFileExtensions(), ApiQuerySiteinfo\appendGeneralInfo(), ApiQuerySiteinfo\appendInterwikiMap(), ApiQuerySiteinfo\appendLanguageVariants(), ApiQuerySiteinfo\appendNamespaceAliases(), ApiQuerySiteinfo\appendProtocols(), ApiQuerySiteinfo\appendRestrictions(), ApiQuerySiteinfo\appendRightsInfo(), ApiQuerySiteinfo\appendSubscribedHooks(), ApiQuerySiteinfo\appendUploadDialog(), ApiQuerySiteinfo\appendUserGroups(), Skin\buildSidebar(), ApiMain\checkBotReadOnly(), ApiMain\checkConditionalRequestHeaders(), OutputPage\checkLastModified(), ApiMain\checkMaxLag(), ApiUpload\checkVerification(), DifferenceEngine\debug(), ApiBase\dieWithErrorOrDebug(), OutputPage\disallowUserJs(), ApiMain\errorMessagesFromException(), ApiProtect\execute(), ApiUndelete\execute(), ApiEmailUser\execute(), ApiUpload\execute(), ApiEditPage\execute(), ApiFormatPhp\execute(), ApiChangeAuthenticationData\execute(), ApiQueryAllMessages\execute(), ApiBlock\execute(), ApiQueryAuthManagerInfo\execute(), ApiQueryBlocks\execute(), ApiRollback\execute(), ApiQueryAllUsers\execute(), ApiQueryFileRepoInfo\execute(), ApiQueryLogEvents\execute(), ApiFeedRecentChanges\execute(), ApiRemoveAuthenticationData\execute(), ApiFeedContributions\execute(), ApiSetPageLanguage\execute(), ApiFeedWatchlist\execute(), ApiResetPassword\execute(), ApiLogin\execute(), ApiOpenSearch\execute(), ApiQueryUsers\execute(), ApiQueryRevisionsBase\extractDeprecatedContent(), OldChangesList\formatChangeLine(), HistoryPager\formatRow(), UsersPager\formatRow(), BlockListPager\formatValue(), HTMLForm\getAction(), OutputPage\getAdvertisedFeedTypes(), ApiImport\getAllowedImportSources(), ApiQueryLogEvents\getAllowedLogActions(), ApiResetPassword\getAllowedParams(), ApiFeedRecentChanges\getAllowedParams(), ApiBlock\getAllowedParams(), ApiQueryProtectedTitles\getAllowedParams(), ApiQueryExtLinksUsage\getAllowedParams(), ApiFeedContributions\getAllowedParams(), ApiFeedWatchlist\getAllowedParams(), ApiQueryAllPages\getAllowedParams(), ApiQueryAllRevisions\getAllowedParams(), ApiOpenSearch\getAllowedParams(), ApiQueryCategoryMembers\getAllowedParams(), ApiQueryAllImages\getAllowedParams(), ApiQueryBlocks\getAllowedParams(), ApiQueryAllUsers\getAllowedParams(), ApiQueryBacklinksprop\getAllowedParams(), ApiQueryLogEvents\getAllowedParams(), ApiQueryAllDeletedRevisions\getAllowedParams(), ApiQueryUserContribs\getAllowedParams(), HTMLForm\getButtons(), Skin\getCachedNotice(), ApiQuerySiteinfo\getCacheMode(), OutputPage\getCacheVaryCookies(), Skin\getCategoryLinks(), ApiUpload\getChunkResult(), Skin\getCopyright(), Skin\getCopyrightIcon(), OutputPage\getCSPNonce(), ApiQueryUserInfo\getCurrentUserInfo(), ImageListPager\getDefaultSort(), UploadForm\getDescriptionSection(), DifferenceEngine\getDiffBodyCacheKeyParams(), HistoryPager\getEndBody(), ApiResetPassword\getExamplesMessages(), ApiSetPageLanguage\getExtendedDescription(), ApiLogin\getExtendedDescription(), UploadForm\getExtensionsMessage(), OutputPage\getFeaturePolicyReportOnly(), ImageListPager\getFieldNames(), ApiCSPReport\getFlags(), ImageListPager\getForm(), OutputPage\getFrameOptions(), OutputPage\getHeadLinksArray(), HTMLForm\getHiddenFields(), CategoryViewer\getHTML(), HTMLButtonField\getInputHTML(), EnhancedChangesList\getLineData(), Skin\getLogo(), DifferenceEngine\getMarkPatrolledLinkInfo(), ApiMain\getMaxLag(), ApiBase\getModuleSourceInfo(), OutputPage\getOriginTrials(), ApiPageSet\getPageTableFields(), Skin\getPoweredBy(), NewFilesPager\getQueryInfo(), ActiveUsersPager\getQueryInfo(), ApiQueryUserInfo\getRateLimits(), OutputPage\getReportTo(), Skin\getSkinStylePath(), UploadForm\getSourceSection(), ApiQueryInfo\getVisitingWatcherInfo(), ApiQueryInfo\getWatcherInfo(), ApiMain\handleCORS(), ApiResetPassword\hasAnyRoutes(), OutputPage\headElement(), ApiFormatBase\initPrinter(), ApiLogin\isDeprecated(), ImageListPager\isFieldSortable(), ContribsPager\isQueryableRange(), ApiMain\logRequest(), Skin\makeFooterIcon(), ApiQueryImageInfo\mergeThumbParams(), OutputPage\output(), ApiMain\printResult(), EnhancedChangesList\recentChangesBlockGroup(), EnhancedChangesList\recentChangesBlockLine(), ChangesList\recentChangesFlags(), ApiQueryInfo\requestExtraData(), ApiBase\requirePostedParameters(), ApiQueryAllRevisions\run(), ApiQueryAllDeletedRevisions\run(), ApiQueryExtLinksUsage\run(), ApiQuerySearch\run(), ApiQueryCategoryMembers\run(), ApiQueryAllPages\run(), ApiQueryAllImages\run(), ApiQueryQueryPage\run(), ApiQueryBacklinksprop\run(), OutputPage\sendCacheControl(), ApiMain\sendCacheHeaders(), HTMLForm\setDisplayFormat(), ApiMain\setRequestExpectations(), SkinTemplate\setupTemplate(), OutputPage\showLagWarning(), LogEventsList\showOptions(), LoginHelper\showReturnToPage(), OutputPage\styleLink(), and ApiMain\substituteResultWithError(). Definition at line 40 of file ContextSource.php. References $context, class, RequestContext\getMain(), null, and wfDebug(). Referenced by RevisionItem\__construct(), ApiMain\__construct(), ApiBase\__construct(), OutputPage\addSubtitle(), EditPageTest\assertEdit(), SkinTemplate\buildContentNavigationUrls(), UsersPager\buildGroupLink(), SkinTemplate\buildNavUrls(), canUseWikiPage(), DerivativeContext\canUseWikiPage(), CategoryViewer\clearCategoryState(), ApiEmailUser\execute(), ApiHelp\execute(), ApiRevisionDelete\execute(), ApiExpandTemplates\execute(), ApiUnblock\execute(), ApiBlock\execute(), ApiOptions\execute(), ApiParse\execute(), ApiComparePages\execute(), ApiFeedContributions\execute(), ApiUserrights\execute(), ApiQueryUsers\execute(), ApiMain\executeAction(), ApiMain\executeActionWithErrorHandling(), exportSession(), ApiQueryRevisionsBase\extractDeprecatedContent(), OutputPageTest\extractHTMLTitle(), ApiFeedContributions\feedItem(), ChangesList\formatCharacterDifference(), ContribsPager\formatRow(), ProtectedPagesPager\formatValue(), DifferenceEngine\generateContentDiffBody(), DifferenceEngine\generateTextDiffBody(), ApiUpload\getChunkResult(), getConfig(), DerivativeContext\getConfig(), ApiComparePages\getDiffRevision(), FormatMetadata\getExtendedMetadataFromHook(), ApiLinkAccount\getFinalDescription(), ApiAMCreateAccount\getFinalDescription(), ApiClientLogin\getFinalDescription(), ApiBase\getFinalDescription(), ApiBase\getFinalParamDescription(), ApiBase\getFinalSummary(), ImageListPager\getForm(), OutputPage\getHeadLinksArray(), OutputPage\getJSVars(), getLanguage(), DerivativeContext\getLanguage(), EditWatchlistNormalHTMLForm\getLegend(), getOutput(), DerivativeContext\getOutput(), UsersPager\getPageHeader(), DifferenceEngine\getParserOutput(), ApiOptions\getPreferences(), getRequest(), DerivativeContext\getRequest(), getSkin(), DerivativeContext\getSkin(), DifferenceEngine\getSlotDiffRenderers(), UploadForm\getSourceSection(), NewFilesPager\getStartBody(), CategoryPager\getStartForm(), DerivativeContext\getTiming(), getTiming(), getTitle(), DerivativeContext\getTitle(), HTMLForm\getTitle(), ApiUserrights\getUrUser(), getUser(), DerivativeContext\getUser(), getWikiPage(), DerivativeContext\getWikiPage(), OutputPage\headElement(), HistoryPager\historyLine(), ChangesList\insertLog(), ChangesList\insertLogEntry(), ChangesList\insertRollback(), LogEventsList\logLine(), ApiParse\makeParserOptions(), msg(), SkinTemplate\outputPage(), OutputPage\parserOptions(), ApiUpload\performUpload(), SkinTemplate\prepareQuickTemplate(), SpecialTags\processCreateTagForm(), SpecialTags\processTagForm(), SpecialUnblock\processUIUnblock(), ChangesList\recentChangesFlags(), ApiOptions\resetPreferences(), MediaWiki\Preferences\DefaultPreferencesFactory\saveFormData(), OutputPage\setHTMLTitle(), OutputPage\setPageTitle(), OutputPage\setTitle(), SpecialComparePages\showDiff(), DifferenceEngine\showDiffPage(), LogEventsList\showOptions(), MediaWiki\Preferences\DefaultPreferencesFactory\submitForm(), SkinTemplate\tabAction(), ArticleViewTest\testArticleAfterFetchContentObjectHook(), ArticleViewTest\testArticleContentViewCustomHook(), ArticleViewTest\testArticleRevisionViewCustomHook(), ArticleViewTest\testArticleViewHeaderHook(), EditPageTest\testCheckDirectEditingDisallowed_forNonTextContent(), ApiStructureTest\testDocumentationExists(), OldChangesListTest\testRecentChangesLine_prefix(), EnhancedChangesListTest\testRecentChangesPrefix(), ArticleViewTest\testShowMissingArticleHook(), ArticleViewTest\testUnhiddenViewOfDeletedRevision(), ArticleViewTest\testView(), ArticleViewTest\testViewCached(), ArticleViewTest\testViewDeletedPage(), ArticleViewTest\testViewMessagePage(), ArticleViewTest\testViewMissingPage(), ArticleViewTest\testViewMissingUserPage(), ArticleViewTest\testViewNonText(), ArticleViewTest\testViewOfCurrentRevision(), ArticleViewTest\testViewOfDeletedRevision(), ArticleViewTest\testViewOfMissingRevision(), ArticleViewTest\testViewOfOldRevision(), ArticleViewTest\testViewRedirect(), ArticleViewTest\testViewUserPageOfNonexistingUser(), and DifferenceEngine\textDiff(). Definition at line 128 of file ContextSource.php. Referenced by AllMessagesTablePager\__construct(), ApiMain\__construct(), DifferenceEngine\addHeader(), OutputPage\addInlineStyle(), ApiMain\addRequestedFields(), Skin\buildSidebar(), OutputPage\enableOOUI(), ApiHelp\execute(), ApiLogout\execute(), ApiParamInfo\execute(), ApiQueryAllMessages\execute(), ApiFeedWatchlist\execute(), ApiLogin\execute(), FormatMetadata\fetchExtendedMetadata(), OldChangesList\formatChangeLine(), ApiParse\formatLangLinks(), SkinTemplate\formatLanguageName(), FormatMetadata\formatNum(), DeletedContribsPager\formatRevisionRow(), CategoryPager\formatRow(), UsersPager\formatRow(), NewFilesPager\formatRow(), ActiveUsersPager\formatRow(), ContribsPager\formatRow(), BlockListPager\formatValue(), ProtectedPagesPager\formatValue(), AllMessagesTablePager\formatValue(), ImageListPager\formatValue(), ChangesList\getArticleLink(), UploadForm\getExtensionsMessage(), CategoryViewer\getHTML(), Skin\getHtmlElementAttributes(), SkinTemplate\getLanguages(), IndexPager\getLimitLinks(), TablePager\getLimitSelectList(), AlphabeticPager\getNavigationBar(), ReverseChronologicalPager\getNavigationBar(), DeletedContribsPager\getNavigationBar(), FormatMetadata\getPriorityLanguages(), ImageGalleryBase\getRenderLang(), BlockListPager\getRestrictionListHTML(), DifferenceEngine\getRevisionHeader(), OutputPage\getRlClientContext(), DifferenceEngine\getSlotHeader(), UploadForm\getSourceSection(), ImageHistoryList\getThumbForLine(), ChangesList\getTimestamp(), OutputPage\headElement(), HistoryPager\historyLine(), ImageHistoryList\imageHistoryLine(), ChangesList\insertDateHeader(), ChangesList\insertLogEntry(), ChangesList\insertUserRelatedLinks(), Skin\lastModified(), LogEventsList\logLine(), FormatMetadata\makeFormattedData(), SkinTemplate\prepareQuickTemplate(), EnhancedChangesList\recentChangesBlockGroup(), EnhancedChangesList\recentChangesLine(), HistoryPager\revLink(), OutputPage\showLagWarning(), DifferenceEngine\showMissingRevision(), OutputPage\styleLink(), and Skin\subPageSubtitle(). Definition at line 112 of file ContextSource.php. Referenced by OOUIHTMLForm\__construct(), UploadForm\__construct(), CategoryViewer\__construct(), DifferenceEngineSlotDiffRenderer\addModules(), UploadForm\addUploadJS(), EnhancedChangesList\beginRecentChangesList(), ChangesList\beginRecentChangesList(), Skin\bottomScripts(), SkinTemplate\buildContentNavigationUrls(), SkinTemplate\buildNavUrls(), ApiMain\checkConditionalRequestHeaders(), ImportReporter\close(), HTMLForm\displayForm(), TablePager\getBody(), Skin\getCachedNotice(), Skin\getCategories(), Skin\getCategoryLinks(), Skin\getDefaultModules(), HTMLForm\getErrorsOrWarnings(), VFormHTMLForm\getHTML(), CategoryViewer\getHTML(), HTMLForm\getHTML(), CategoryViewer\getImageSection(), SkinTemplate\getLanguages(), DifferenceEngine\getMarkPatrolledLinkInfo(), TablePager\getNavigationBar(), Skin\getNewtalks(), CategoryViewer\getPagesSection(), Skin\getRevisionId(), HistoryPager\getStartBody(), ApiMain\handleCORS(), Skin\lastModified(), ImportReporter\open(), SkinTemplate\outputPage(), ImageListPager\outputUserDoesNotExist(), SkinTemplate\prepareQuickTemplate(), DifferenceEngine\renderNewRevision(), ImportReporter\reportNotice(), ImportReporter\reportPage(), ApiMain\sendCacheHeaders(), DifferenceEngine\showDiff(), DifferenceEngine\showDiffPage(), CustomDifferenceEngine\showDiffStyle(), DifferenceEngine\showDiffStyle(), DifferenceEngine\showMissingRevision(), LoginHelper\showReturnToPage(), Skin\subPageSubtitle(), and TraditionalImageGallery\toHTML(). Definition at line 71 of file ContextSource.php. Referenced by TablePager\__construct(), ApiContinuationManager\__construct(), UsersPager\__construct(), ImageListPager\__construct(), IndexPager\__construct(), ApiMain\__construct(), OutputPage\addAcceptLanguage(), SkinTemplate\buildContentNavigationUrls(), SkinTemplate\buildNavUrls(), SkinTemplate\buildPersonalUrls(), ApiMain\checkConditionalRequestHeaders(), ApiMain\checkExecutePermissions(), OutputPage\checkLastModified(), ApiMain\checkMaxLag(), CategoryViewer\clearCategoryState(), ApiFormatBase\closePrinter(), ApiMain\createErrorPrinter(), ApiCSPReport\error(), ApiCheckToken\execute(), ApiEditPage\execute(), ApiQueryTokens\execute(), ApiQueryDeletedrevs\execute(), ApiCSPReport\execute(), ApiFeedRecentChanges\execute(), ApiLogin\execute(), ApiMain\executeActionWithErrorHandling(), OOUIHTMLForm\getButtons(), HTMLForm\getButtons(), ApiQueryUserInfo\getCurrentUserInfo(), LogEventsList\getDefaultQuery(), IndexPager\getDefaultQuery(), LogPager\getFilterParams(), ImageListPager\getForm(), OutputPage\getHeadLinksArray(), TablePager\getHiddenFields(), ApiCSPReport\getReport(), OutputPage\getRlClientContext(), UploadForm\getSourceSection(), NewFilesPager\getStartBody(), ApiTokens\getTokenTypes(), Skin\getUndeleteLink(), ApiMain\getUpload(), ApiMain\getUserAgent(), ApiMain\getVal(), ApiMain\handleCORS(), ApiMain\handleException(), PageDataRequestHandler\handleRequest(), OutputPage\haveCacheVaryCookies(), ApiQuery\instantiateModules(), ApiMain\lacksSameOriginSecurity(), HTMLForm\loadData(), ApiBase\logFeatureUsage(), ApiMain\logRequest(), OutputPage\output(), HTMLForm\prepareForm(), SkinTemplate\prepareQuickTemplate(), ApiMain\reportUnusedParams(), ApiBase\requirePostedParameters(), OutputPage\returnToMain(), ApiQueryRecentChanges\run(), OutputPage\sendCacheControl(), ApiMain\sendCacheHeaders(), ApiMain\setRequestExpectations(), ApiMain\setupExternalResponse(), SkinTemplate\setupTemplateForOutput(), DifferenceEngine\showDiffPage(), OutputPage\showPermissionsErrorPage(), HTMLForm\tryAuthorizedSubmit(), OutputPage\userCanPreview(), ApiBase\useTransactionalTimeLimit(), ApiBase\validateToken(), and ApiCSPReport\verifyPostBodyOk(). Definition at line 136 of file ContextSource.php. Referenced by OutputPage\enableOOUI(), OutputPage\getJSVars(), OutputPage\getRlClient(), OutputPage\getRlClientContext(), and OutputPage\output(). Definition at line 154 of file ContextSource.php. Definition at line 144 of file ContextSource.php. Definition at line 79 of file ContextSource.php. Referenced by OutputPage\addAcceptLanguage(), OutputPage\addParserOutputMetadata(), Skin\addToSidebarPlain(), OutputPage\addWikiText(), OutputPage\addWikiTextAsContent(), OutputPage\addWikiTextAsInterface(), OutputPage\addWikiTextTidy(), SkinTemplate\buildContentNavigationUrls(), SkinTemplate\buildNavUrls(), SkinTemplate\buildPersonalUrls(), HistoryPager\curLink(), HistoryPager\formatRow(), Skin\getCategories(), Skin\getCategoryLinks(), Skin\getCopyright(), OutputPage\getDisplayTitle(), HistoryPager\getEndBody(), ParserCache\getETag(), OutputPage\getHeadLinksArray(), OutputPage\getJSVars(), ParserCache\getKey(), SkinTemplate\getLanguages(), SkinTemplate\getNameSpaceKey(), TablePager\getNavigationBar(), UsersPager\getPageHeader(), Skin\getRelevantTitle(), HistoryPager\getStartBody(), Skin\getUndeleteLink(), OutputPage\getUnprefixedDisplayTitle(), OutputPage\headElement(), HistoryPager\historyLine(), MediaWiki\initializeArticle(), Skin\isRevisionCurrent(), HistoryPager\lastLink(), Skin\lastModified(), IndexPager\makeLink(), OutputPage\parse(), OutputPage\parseAsContent(), OutputPage\parseAsInterface(), OutputPage\parseInline(), SkinTemplate\prepareQuickTemplate(), Skin\printSource(), HistoryPager\revLink(), OutputPage\setFeedAppendQuery(), SkinTemplate\setupTemplateForOutput(), OutputPage\userCanPreview(), and OutputPage\wrapWikiTextAsInterface(). Definition at line 120 of file ContextSource.php. Referenced by UploadForm\__construct(), HistoryPager\__construct(), LogEventsList\__construct(), IndexPager\__construct(), ApiBase\addBlockInfoToStatus(), ImageHistoryList\beginImageHistoryList(), SkinTemplate\buildContentNavigationUrls(), SkinTemplate\buildNavUrls(), SkinTemplate\buildPersonalUrls(), ApiMain\canApiHighLimits(), ApiMain\checkAsserts(), ApiMain\checkConditionalRequestHeaders(), ApiMain\checkExecutePermissions(), OutputPage\checkLastModified(), ApiMain\checkReadOnly(), ApiQueryRevisionsBase\checkRevDel(), ApiBase\checkTitleUserPermissions(), ApiBase\checkUserRightsAny(), DifferenceEngine\deletedLink(), ApiQuery\doExport(), LogPager\enforceActionRestrictions(), LogPager\enforcePerformerRestrictions(), ApiBase\errorArrayToStatus(), ApiValidatePassword\execute(), ApiImageRotate\execute(), ApiProtect\execute(), ApiManageTags\execute(), ApiUndelete\execute(), ApiClearHasMsg\execute(), ApiMove\execute(), ApiEmailUser\execute(), ApiImport\execute(), ApiCheckToken\execute(), ApiWatch\execute(), ApiUpload\execute(), ApiLogout\execute(), ApiPurge\execute(), ApiEditPage\execute(), ApiQueryStashImageInfo\execute(), ApiQueryTokens\execute(), ApiRevisionDelete\execute(), ApiTag\execute(), ApiUnblock\execute(), ApiQueryMyStashedFiles\execute(), ApiChangeAuthenticationData\execute(), ApiSetNotificationTimestamp\execute(), ApiPatrol\execute(), ApiFileRevert\execute(), ApiBlock\execute(), ApiDelete\execute(), ApiQueryAuthManagerInfo\execute(), ApiQueryBlocks\execute(), ApiRollback\execute(), ApiQueryDeletedrevs\execute(), ApiQueryFilearchive\execute(), ApiParse\execute(), ApiCSPReport\execute(), ApiQueryLogEvents\execute(), ApiStashEdit\execute(), ApiQueryImageInfo\execute(), ApiRemoveAuthenticationData\execute(), ApiSetPageLanguage\execute(), ApiUserrights\execute(), ApiAMCreateAccount\execute(), ApiLinkAccount\execute(), ApiResetPassword\execute(), ApiQueryRevisionsBase\extractDeprecatedContent(), ApiQueryWatchlist\extractOutputData(), ApiQueryInfo\extractPageInfo(), ApiQueryLogEvents\extractRowInfo(), ApiQueryRecentChanges\extractRowInfo(), DeletedContribsPager\formatRevisionRow(), HistoryPager\formatRow(), UsersPager\formatRow(), ContribsPager\formatRow(), BlockListPager\formatValue(), ProtectedPagesPager\formatValue(), ImageListPager\formatValue(), ApiQueryLogEvents\getCacheMode(), Skin\getCategories(), Skin\getCategoryLinks(), ApiUpload\getChunkResult(), ApiUpload\getContextResult(), ApiQueryUserInfo\getCurrentUserInfo(), Skin\getDefaultModules(), UploadForm\getDescriptionSection(), ApiComparePages\getDiffRevision(), HistoryPager\getEndBody(), OutputPage\getHeadLinksArray(), HTMLForm\getHiddenFields(), OutputPage\getJSVars(), ApiQueryUserInfo\getLatestContributionTime(), EnhancedChangesList\getLineData(), EnhancedChangesList\getLogText(), DifferenceEngine\getMarkPatrolledLinkInfo(), PreferencesFormOOUI\getModifiedUser(), Skin\getNewtalks(), UploadForm\getOptionsSection(), Skin\getPageClasses(), ApiParse\getParsedContent(), NewPagesPager\getQueryInfo(), ActiveUsersPager\getQueryInfo(), DeletedContribsPager\getQueryInfo(), UsersPager\getQueryInfo(), ContribsPager\getQueryInfo(), BlockListPager\getQueryInfo(), ApiQueryUserInfo\getRateLimits(), ApiComparePages\getRevisionById(), DifferenceEngine\getRevisionHeader(), OutputPage\getRlClientContext(), LogEventsList\getShowHideLinks(), Skin\getSiteNotice(), UploadForm\getSourceSection(), HistoryPager\getStartBody(), ImageHistoryList\getThumbForLine(), ApiTokens\getTokenTypes(), LogEventsList\getTypeMenuDesc(), Skin\getUndeleteLink(), ApiOptions\getUserForUpdates(), ApiQueryInfo\getVisitingWatcherInfo(), ApiQueryInfo\getWatchedInfo(), ApiQueryInfo\getWatcherInfo(), ApiBase\getWatchlistUser(), ApiBase\getWatchlistValue(), OutputPage\headElement(), HistoryPager\historyLine(), ImageHistoryList\imageHistoryLine(), ApiPageSet\initFromRevIDs(), ChangesList\insertDateHeader(), ChangesList\insertDiffHist(), Skin\lastModified(), LogPager\limitType(), DifferenceEngine\loadNewText(), DifferenceEngine\loadText(), ApiBase\logFeatureUsage(), LogEventsList\logLine(), ApiMain\logRequest(), ApiMergeHistory\merge(), ApiMove\movePage(), OutputPage\parserOptions(), ApiUpload\performStash(), ApiUpload\performUpload(), Skin\preloadExistence(), ApiQueryUserContribs\prepareQuery(), ApiTag\processIndividual(), DifferenceEngine\renderNewRevision(), ImportReporter\reportPage(), DifferenceEngine\revisionDeleteLink(), HistoryPager\revLink(), ApiQueryDeletedRevisions\run(), ApiQueryAllRevisions\run(), ApiQueryAllDeletedRevisions\run(), ApiQueryWatchlist\run(), ApiQueryRevisions\run(), ApiQueryRecentChanges\run(), ApiUpload\selectUploadModule(), DifferenceEngine\setRevisions(), ApiMain\setupExternalResponse(), SkinTemplate\setupTemplateForOutput(), ApiComparePages\setVals(), ApiBase\setWatch(), ChangesList\showAsUnpatrolled(), DifferenceEngine\showDiffPage(), Skin\showEmailUser(), ApiQueryBase\showHiddenUsersAddBlockInfo(), OutputPage\showPermissionsErrorPage(), HTMLForm\tryAuthorizedSubmit(), RevDelList\updateLog(), OutputPage\userCanPreview(), ApiQueryBase\userCanSeeRevDel(), and ApiBase\validateToken(). Definition at line 104 of file ContextSource.php. Referenced by SkinTemplate\buildContentNavigationUrls(), HistoryPager\curLink(), OutputPage\getJSVars(), HistoryPager\getQueryInfo(), SkinTemplate\prepareQuickTemplate(), and DifferenceEngine\renderNewRevision(). Definition at line 168 of file ContextSource.php. Referenced by UploadForm\__construct(), DeletedContribsPager\__construct(), ContribsPager\__construct(), ApiBase\addDeprecation(), OutputPage\addHelpLink(), DifferenceEngine\addLocalisedTitleTooltipsCb(), OutputPage\addReturnTo(), Skin\addToSidebar(), Skin\addToSidebarPlain(), OutputPage\addWikiMsgArray(), ApiQuerySiteinfo\appendSkins(), ImageHistoryList\beginImageHistoryList(), SkinTemplate\buildContentNavigationUrls(), SkinTemplate\buildNavUrls(), SkinTemplate\buildPersonalUrls(), ApiUpload\checkPermissions(), ApiBase\checkUserRightsAny(), ImportReporter\close(), ApiFormatBase\closePrinter(), FormatMetadata\collapseContactInfo(), Skin\doEditSectionLink(), ApiQueryTags\execute(), ApiOptions\execute(), ApiParse\execute(), ApiFeedWatchlist\execute(), FormatMetadata\exifMsg(), ApiQueryRevisionsBase\extractAllSlotInfo(), Skin\footerLink(), Skin\footerLinkTitle(), FormatMetadata\formatCoords(), OutputPage\formatPermissionsErrorMessage(), DeletedContribsPager\formatRevisionRow(), CategoryPager\formatRow(), UsersPager\formatRow(), ActiveUsersPager\formatRow(), ContribsPager\formatRow(), BlockListPager\formatValue(), ProtectedPagesPager\formatValue(), AllMessagesTablePager\formatValue(), ImageListPager\formatValue(), LogEventsList\getActionSelectorDesc(), OOUIHTMLForm\getButtons(), PreferencesFormOOUI\getButtons(), VFormHTMLForm\getButtons(), HTMLForm\getButtons(), Skin\getCachedNotice(), Skin\getCategoryLinks(), Skin\getCopyright(), CategoryViewer\getCountMessage(), DifferenceEngine\getDiff(), EnhancedChangesList\getDiffHistLinks(), TablePager\getEmptyBody(), UploadForm\getExtensionsMessage(), ApiFeedRecentChanges\getFeedObject(), BlockListPager\getFieldNames(), ProtectedPagesPager\getFieldNames(), ImageListPager\getFieldNames(), AllMessagesTablePager\getFieldNames(), LogEventsList\getFiltersDesc(), ApiBase\getFinalParamDescription(), OutputPage\getHeadLinksArray(), CategoryViewer\getHTML(), CategoryViewer\getImageSection(), EditWatchlistNormalHTMLForm\getLegend(), HTMLForm\getLegend(), TablePager\getLimitDropdown(), EnhancedChangesList\getLineData(), EnhancedChangesList\getLogText(), AlphabeticPager\getNavigationBar(), ReverseChronologicalPager\getNavigationBar(), DeletedContribsPager\getNavigationBar(), TablePager\getNavigationBar(), Skin\getNewtalks(), UsersPager\getPageHeader(), CategoryViewer\getPagesSection(), ApiParse\getParsedContent(), BlockListPager\getRestrictionListHTML(), HistoryPager\getRevisionButton(), DifferenceEngine\getRevisionHeader(), UploadForm\getSourceSection(), HistoryPager\getStartBody(), AllMessagesTablePager\getStartBody(), CategoryViewer\getSubcategorySection(), HTMLForm\getSubmitText(), ImageHistoryList\getThumbForLine(), Skin\getUndeleteLink(), ApiUpload\handleStashException(), OutputPage\headElement(), HistoryPager\historyLine(), ImageHistoryList\imageHistoryLine(), ChangesList\insertComment(), ChangesList\insertLog(), ChangesList\insertUserRelatedLinks(), FormatMetadata\langItem(), Skin\lastModified(), DifferenceEngine\localiseLineNumbersCb(), Skin\logoText(), Skin\mainPageLink(), FormatMetadata\makeFormattedData(), IndexPager\makeLink(), DifferenceEngine\markPatrolledLink(), ApiMain\modifyHelp(), ChangesList\numberofWatchingusers(), CategoryViewer\pagingLinks(), ChangesList\preCacheMessages(), SkinTemplate\prepareQuickTemplate(), Skin\printSource(), EnhancedChangesList\recentChangesBlockGroup(), ImportReporter\reportNotice(), ImportReporter\reportPage(), OutputPage\setPageTitle(), HTMLForm\setSubmitTextMsg(), HTMLForm\setWrapperLegendMsg(), DifferenceEngine\showDiffPage(), OutputPage\showErrorPage(), OutputPage\showFatalError(), OutputPage\showFileCopyError(), OutputPage\showFileDeleteError(), OutputPage\showFileNotFoundError(), OutputPage\showFileRenameError(), DifferenceEngine\showMissingRevision(), LogEventsList\showOptions(), OutputPage\showPermissionsErrorPage(), OutputPage\showUnexpectedValueError(), Skin\subPageSubtitle(), ApiMain\substituteResultWithError(), TraditionalImageGallery\toHTML(), MediaWiki\Preferences\DefaultPreferencesFactory\validateSignature(), OutputPage\versionRequired(), and OutputPage\wrapWikiMsg(). Definition at line 55 of file ContextSource.php. Referenced by TablePager\__construct(), UploadForm\__construct(), LoginHelper\__construct(), UsersPager\__construct(), RevisionListBase\__construct(), ImageListPager\__construct(), ImageHistoryList\__construct(), ChangesList\__construct(), LogEventsList\__construct(), DerivativeContext\__construct(), CategoryViewer\__construct(), ImageGalleryBase\__construct(), IndexPager\__construct(), ApiMain\__construct(), DifferenceEngine\__construct(), ApiBase\__construct(), HTMLForm\__construct(), OutputPage\__construct(), SkinTemplate\buildContentNavigationUrls(), ChangesList\flag(), FormatMetadata\flattenArrayContentLang(), FormatMetadata\getFormattedData(), SkinTemplate\outputPage(), DerivativeContext\setSkin(), RequestContext\setSkin(), and ArticleViewTest\testUnhiddenViewOfDeletedRevision(). Definition at line 33 of file ContextSource.php. Referenced by PackedImageGallery\__construct(), SlideshowImageGallery\__construct(), OOUIHTMLForm\__construct(), TablePager\__construct(), UploadForm\__construct(), EnhancedChangesList\__construct(), UsersPager\__construct(), ActiveUsersPager\__construct(), ImageHistoryList\__construct(), AllMessagesTablePager\__construct(), LogEventsList\__construct(), ImageGalleryBase\__construct(), IndexPager\__construct(), ApiMain\__construct(), DifferenceEngine\__construct(), HTMLForm\__construct(), ApiFormatBase\closePrinter(), ApiHelp\execute(), ApiParse\execute(), ApiFeedRecentChanges\execute(), ApiComparePages\execute(), ApiQueryUsers\execute(), ApiQueryRevisionsBase\extractDeprecatedContent(), ImageGalleryBase\factory(), ChangesList\flag(), FormatMetadata\flattenArrayContentLang(), getContext(), FormatMetadata\getFormattedData(), OutputPage\getRlClient(), ApiCSPReport\logReport(), ApiPageSet\processTitlesArray(), setContext(), ChangesList\showCharacterDifference(), LogEventsList\showLogExtract(), and LogEventsList\showOptions().